A new graduate of Middle Georgia State, Rachel Maddox is headed to Mercer Law School and a career advocating for civil rights. High School: "I was homeschooled and got my diploma accredited through Forest Park Street School. I was a member of the Middle Georgia Christian Homeschool Association’s mock trial team and MGCHSA chorus." Family: Parents, Cary and Lorraine Maddox. Four siblings, Josh, Alana, Sarah, and Suzy, all of whom are attending or have attended Middle Georgia State. Two cats, Lizzie and Siegfried, and her “old man” Jack Russell Terrier, Oscar. Employment: "I have two jobs, one as the Honors Program student coordinator, working for Dr. Clay Morton, and one as an intern downtown with NewTown Macon." Degree Objective: Bachelor of Arts in English with Minor in Creative Writing. Primary Campus: Macon. Activities: "I’m co-president of the English Studies Organization, president of Alpha Rho Sigma (our chapter of Sigma Tau Delta, an English honors society), an active Honors student, and former SGA senator." Career Goals: "I’m going to Mercer Law School in the fall because I want to be a civil rights and human rights attorney. I’ve always wanted to make a tangible, observable difference in the world around me, and I think that one of the best ways I can do that is by helping people who get overlooked or shortchanged by our legal system and society at large." She chose Middle Georgia State University because … "There were a variety of reasons. I dual-enrolled at MGA, so I was familiar with the campus before attending fulltime. I liked my professors and felt like they really cared about me. And of course, MGA is affordable. The biggest single reason I decided to go here, though, was the Honors Program. My first fulltime semester I took an honors class with the program director, Dr. Clay Morton, and I had a great experience. While my friends at bigger schools were primarily being taught by grad school student assistants and struggling to gain recognition in big student organizations, I realized that I could immediately get involved in the Honors Program and make connections with faculty members from the start." The greatest thing she discovered about Middle Georgia State after she enrolled was … "The faculty. I’ve loved almost all my professors, and I feel like the vast majority of them, especially in the Department of English, care about my success as a student and my future career." 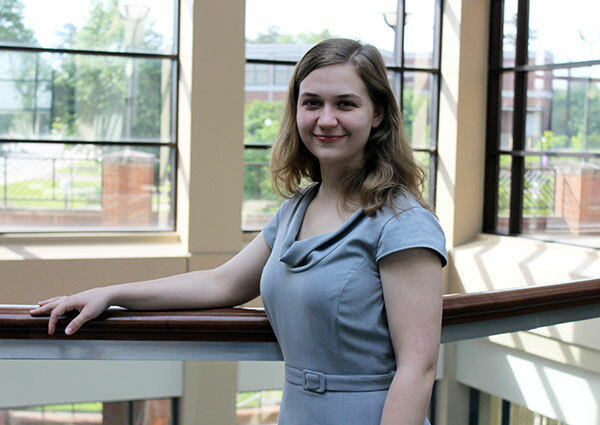 Her greatest academic experience so far as a Middle Georgia State student has been … "I’ve had a lot of great academic experiences at MGA, but I have to say that volunteering at the Macon Campus Writing Center is probably the most important. Dr. Sharon Colley does a fantastic job of creating a relaxing, welcoming atmosphere there, and over the years the Writing Center become a second home to me. I’ve moved to and from several houses and apartments during college, but I’ve always known that I can go to the Writing Center to relax, take a deep breath, and either socialize with other tutors or study for hours uninterrupted." To her, “greatness” means … "Doing what you can with what you have. Falling short of a goal or failing at something you set out to do only reflects badly on you if you didn’t use all your resources to succeed. Different people have different resources - financial, intellectual, and physical - so it’s not reasonable to expect everyone to be able to do the same things. But it is reasonable to expect people, especially ourselves, to try. Just try to make the grades or get the job you always wanted. Even if we don’t succeed, we don’t have to wonder what would have happened if we had done our best." In five years … "I will have graduated with my J.D. and moved into my career. After that, I have a lot of dream jobs. I would love to be a clerk for a judge or work with an advocacy group, especially focusing on immigration or wrongful imprisonment."